ASUSTOR Community Forum • View topic - 【News】ASUSTOR releases the long awaited 10-Gigabit Ethernet Expansion Card! 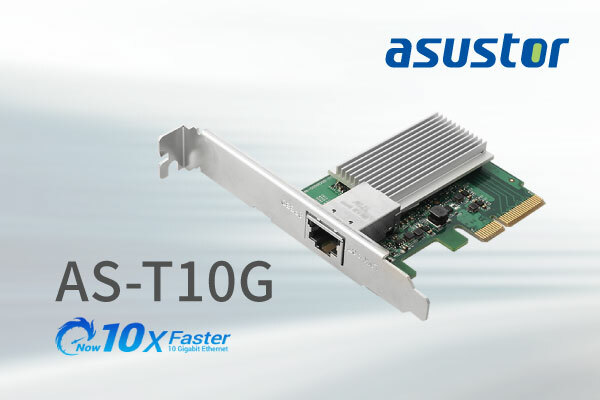 【News】ASUSTOR releases the long awaited 10-Gigabit Ethernet Expansion Card! Taipei, Taiwan, October 23, 2018 – ASUSTOR Inc. has launched the AS-T10G 10G Base-T network card to provide customers with the ability to upgrade their devices to the fastest speeds available for consumers. The AS-T10G is pre-installed with a full-height bracket and comes with a half-height bracket for easy installation in thin computers. The ASUSTOR NAS bracket for the AS7008T and AS7010T can be purchased separately to upgrade to 10GbE speeds. ASUSTOR offers a variety of 10GbE NAS, including, but not limited to the AS4002T, AS4004T, AS7008T, AS7010T, AS7009RDX and the AS7012RDX, allowing workstations and ASUSTOR NAS devices to communicate at ever higher speeds, no matter the budget. ASUSTOR’s AS-T10G has a two year warranty. For detailed purchase information, please contact your worldwide distributor or the ASUSTOR Accessories Store.